My army marches into battle. You can see flame tanks and giants in the front row, while my leader rides the boar (second row). This is it, the biggest battle of this map so far. On my side, four towering giants – amongst the most powerful units in the game – backed by the fruits of military technology: cannon, musketeers, flame-throwing tanks. Against this, the computer’s forces are inadequate. Its giants are frightening, but outnumbered by my own. Its use of battlefield magic – “Wind Ward”, which weakens ranged attacks – is clever, given my overwhelming superiority in ranged troops, but not enough. Its regular soldiers? Pfft. A flame tank explodes beneath an enemy giant’s fists – but I have more. The enemy army dwindles. Their giants stagger, pelted by bullets and flames and magic. The last enemy giant turns toward his tormentor. I check the tooltips. The moment is ripe. My general storms in with “Charge” and “Flanking” bonuses. The giant falls. At this point, I notice my general is riding a giant boar. Welcome to Age of Wonders III, the upcoming fantasy turn-based strategy game from Triumph Studios. I’ve dabbled with the previous AoW games, and after interviewing designer Lennart Sas when AoW3 was first announced last year, I jumped at the chance to try out a preview build. After a number of hours, I’ve now finished two maps — the first mission in each of the game’s two campaigns – and spent some time with a third, random map; here are my impressions. Like its predecessors, AoW3 takes place across two layers. There is a strategic map, where players explore, build cities, and train armies; and there is a tactical battle map, where those armies meet. Even on the strategic map, the focus is on warfare (and indeed, my reviewer’s guide uses the analogy of an RTS). Empire management is quite simple, closer to Warlock than to Civilization. Building up cities unlocks new units, but there is no worker management, few “guns or butter” decisions, and only a modest relationship between terrain and city productivity. There is an interesting twist to character setup – players choose one of six starting races (such as human or elf) but also one of five classes (sorcerer, rogue, warlord, etc). Each race has its own unit roster, but you can recruit other races if you take control of their towns, which turns armies into a menagerie over time. However, each class also has its own unit roster – for example, rogues recruit assassins who can phase through city walls, whereas dreadnoughts (a sort of magitek engineer) gain access to muskets and cannons instead. The early stages of a random map. The real heart of AoW3 lies in its tactical battles. The basic rules are straightforward: units can move only so far in a turn, and the further they move, the fewer times they can attack. Archers do more damage up close than from far, but are less effective if they don’t have a clear shot; units take more damage when flanked; city walls are a defender’s best friend. Battles begin with ineffective pot shots, as archers run out and loose single attacks at extreme range. Then the armies draw close, the combatants start attacking multiple times, and the fights turn vicious. More advanced units are tougher, but not invincible: I’ve seen them one-hit-kill tier-1 foot soldiers, only to be shot apart by the survivors. But advanced units also bend the rules in interesting ways. For example, infantry will do little damage if they run up to attack a distant target – but cavalry inflict bonus damage the further they move. Looking at ranged troops, the basic tier-1 archer, if standing still, can fire three shots a turn, each with an attack strength of 7 to 9. A musketeer has an attack strength of 30 – but only fires every other turn. But due to the way damage is calculated, the archer will struggle against well-armoured units whereas the musketeer can still punch through. Hiding a healer behind a pikeman may often be a good idea – but this leaves them vulnerable to area attacks, such as those of flame tanks and cannons. Still, while I can’t yet tell if AoW3 is a great game, I’m pretty sure it’s a good one. And in a promising sign, the more I learn, the deeper and richer it feels – I only worked out that musketeer tactic tonight! I look forward to playing – and learning – more. (1) Fusing magic and technology has been a growing trend in fantasy literature over the last 5-10 years, but it’s still badly underused in gaming. 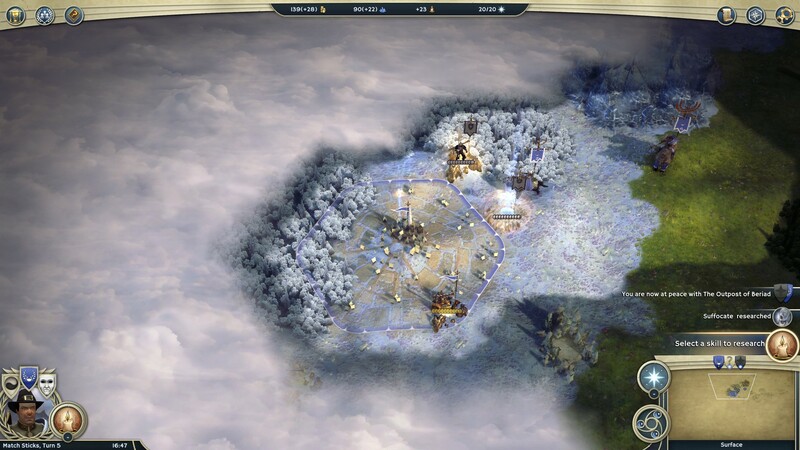 A few other strategy games have done it – there were cannons and flying machines in previous AoW games, Warcraft 2, and the king of fantasy steampunk games, Rise of Legends – but it’s still pretty cool in AoW3. The dreadnought is already my favourite class! Age of Wonders III will be released on 31 March. 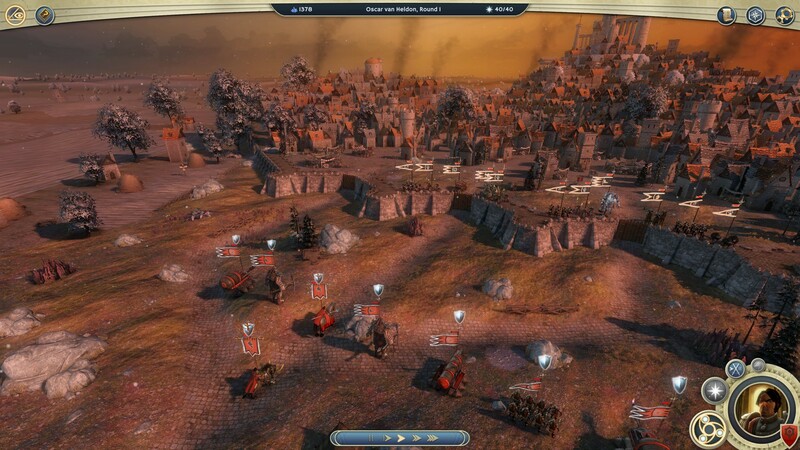 The above comments are based on a preview copy supplied by developer Triumph Studios. I do have some concerns regarding the pacing of the campaign maps – the two I played (the first in each campaign) were lengthy, but it felt as though much of that time was spent waiting, building, and accumulating troops. The first mission on both scenarios are meant for the player to get into the game. And not get destroyed. So it is not that weird that the AI sits in its base and defends. Not attacking the player once. So if the player would be more aggressive there is less waiting/building and more action. (See angryjoes first campaign mission on twitch). It is up to the player if he wants to turtle up or attack on the first mission. After that ill bet things will get more and more complicated in the campaign. I like the fact that you like dreadnoughts as this would be the last class i would play in this game. Just shows that the combinations are endless and this is a good sign.